Last month we looked at the attempts of believers and non-believers alike to escape the terror and boredom of modern life via quest for enchantment launched through time — the annual observances, secular and religious, of the year. In this installment, we shall follow that quest through space. Oddly enough — although this is a quest and quests typically involve long journeys — in our first stage, we are not going far; in fact, we are staying home. As has often been remarked, there are many definitions of “home.” But let’s start with the most obvious — our very own dwelling place. That proverb holds true which says, “it takes a lot to make a house a home.” So many families have little common life to-day; bed, refrigerator, and personal entertainment allow many clans to live as though they were mere fellow lodgers in a boarding house. If you live alone, it is even easier for one’s apartment to degenerate into mere self-storage as one shuttles back and forth between slumber and work. This is a reality, because single or in a family, your home should be your fortress, your citadel of enchantment against the Outside world. Ideally, whatever the style of your furnishings, they should reflect your moods, interests, and personality. We may no longer live in the age of Emily Post’s “well-appointed house;” nevertheless her advice in at least one area remains as true to-day as it was in 1922: “The personality of a house is indefinable, but there never lived a lady of great cultivation and charm whose home, whether a palace, a farm-cottage or a tiny apartment, did not reflect the charm of its owner. Every visitor feels impelled to linger, and is loath to go.” That loathness to go should also be felt by your home’s denizens — again, even if you live alone. But your bedroom — and study of you have one — is your private and personal refuge, just as the dining and living rooms are shared with others who, one hopes are happy to arrive and well, loath to go. This is true for us all. For the Catholic, however, there ought to be one more space, and it can be in whatever room is convenient: the home altar. 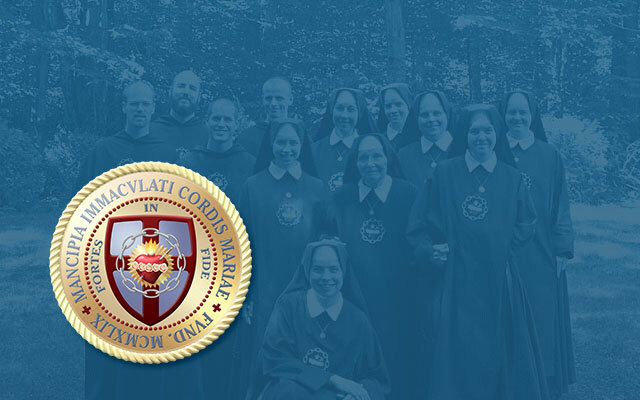 Here might be our enthroned mages of the Sacred and Immaculate Hearts; — a crucifix; icons, pictures, and statues of Our Lady and various saints; a Rosary or two; holy water; blessed medals, palms, and candles; in short, all the sacramentals and other religious items every home should have. The home altar transforms a mere home into a domestic church as well. Far more than fireplace or TV, the home altar should be the centre of family or single life. Here, day by day, we can find a magic that is entirely real. But home is more than our dwelling place — it is our town. In days gone by, most people did not move too far from where they were born. They spoke the local dialect of the national language, and whatever schooling they had (if any) was acquired at their parish church — and the parish was usually the lowest rank of civil government as well. If they lived in a larger village or “market town,” the weekly market and the annual fair (usually around the feast day of the town’s patron saint or some other holy day) was the biggest excitement in their lives — other than the Church’s feasts. We live in much more mobile circumstances to-day, and my own situation is typical of many: on the one hand, I was born in New York City, and the first few years of my life were spent in the lower Hudson Valley. But we visited my Dad’s home town of New Bedford, Massachusetts on various occasions. While I was still young we moved out to Hollywood, and I have lived in Southern California, for the most part, ever since. The result is that, for all my intimate knowledge of Los Angeles, New York and its environs also feel like home, as does Southern New England. My story is very far from uncommon, to-day. So for nostalgia’s sake, many of us travel back whence we came whenever we can — to see relatives and old friends, and the places where we were children. These places of our childhood and youth cast a nostalgic enchantment of their own over us, the cares of our present slip away, and we hear again the voices of loved ones gone from this vale of tears. But the Catholic can take this a step further. In Medieval England, Laetare Sunday in Lent was “Mothering Sunday” — in Britain it still acts as Mother’s Day. But beyond seeing their mothers, the people of that time made it a point to visit the church of their baptism — or even the Cathedral, as the “Mother Church” of their diocese. So adapt this custom, whenever you go back home. If it still exists, visit the church or the churches of your own Baptism, First Communion, and Confirmation. Presuming the interior destruction has not been complete, see the font where your own life of Grace began, kneel where you first received the Bread of Angels, and look upon the spot whereat you received the Holy Ghost to be a Soldier of Christ. If you are fortunate enough to live near the place, visit it whenever you can, offer your thanksgiving to God for the Sacraments, and try to remember the sense of wonder in them you had when first you received their Graces. But what of the “hometown” in which we live now, which may have no connection at all to our origins? How to derive enchantment from the faceless bedroom community suburb or gentrified urban district in which we live? Well, in truth, we must dig a bit. The local historical society or historic district can reveal a great deal about a place; the National Register of Historic Places can point out to us hidden gems of buildings in the strangest corners — so too with public gardens, museums, and zoos. Your local town or city and chamber of commerce websites will reveal local festivals — ethnic and otherwise — and attractions to enjoy. Take the time to discover and patronise local businesses. In a word, treat wherever you find yourself as though you were a tourist, and you shall certainly find things to elevate, educate, and enchant you. For the Catholic, this is even truer. Explore your diocese by internet, and find out her history and shrines — and look into the sites of all the local parishes — you’ll find a Latin Mass there, a Perpetual Adoration Chapel here, and in that place a Gothic jewel that poverty or other circumstances left more or less untouched after the Council. But even if we have learned to find all the magic we can in our own neighbourhoods and towns, we are moderns, and come complete with a certain restlessness of soul. Now it is time to take our quest for enchantment on the road. In days gone by, as with the Canterbury pilgrims, most such travel was by foot, horse, or cart, depending upon one’s income. Then came the railroad, and at last the automobile. With the latter came the development of scenic highways to give drivers beautiful things to see as they travelled, and automobile clubs to assist them in doing so. In the United States these often linked our National and State Parks — and most civilised countries developed the equivalent. Where our ancestors had been primarily restricted to enjoying whatever natural beauty graced their immediate neighbourhood, later generations have been able relatively easily to view an amazing variety of natural wonders: beaches, mountains, forests, wetlands, and deserts. The different cultural regions of the country became more accessible to each other: New England, the Mid-Atlantic, the South, the Midwest, the Mountain States, the Southwest, and the Far West; so too with once-isolated cultural islands, like Franco-Spanish Southern Louisiana, Hispanic Northern New Mexico, and the Pennsylvania Dutch Country. To accommodate long-term and well-healed travellers, the great lodges of the American West were built. Perhaps the greatest tribute to this nation-wide self exploration was the Depression-era Federal Writer’s Project series of guide books, covering each state and certain particular areas within them. Then as now, nothing will make you love your country more than a long road trip. After World War II, jet planes made international travel possible for thousands whose forbears could not afford the luxuries of First Class Passengers’ ships (at least more than once to settle in the United States in the first place!). Initially, for most Americans this meant discovering the British Isles, whence a large chunk of our country’s ancestry as well as most its culture and government structure owes it origins. Such places as the Tower of London and Westminster Abbey, the various rituals surrounding the British Monarchy (reflecting our national love-hate relationship with that institution), Oxford and Cambridge Universities, the residences of various British writers popular in the United States, and the Scots and Irish Clan locations to which so many Americans trace their ancestry drew and draw thousands of enchanted Americans keen on making connexions with their individual and national cultural origins. To-day, however, Americans can be found in almost every country in the world, enjoying whatever pleases them and feeling temporarily liberated from the demands at home. There is the thrill of discovering foreign culture, cuisine, and folklore, and viewing foreign landmarks that may even dwarf our own, as Africa’s Victoria Falls and South America’s Iguazu Falls do our own Niagara. It is to no small degree for the benefit of American travellers that UNESCO (whatever one may think of the United Nations) has developed its World Heritage List, an ever-expanding roster of cultural, historic, and natural sites of significance to all of Mankind. What is true of Americans is of course true of every other nationality with a population whose means allow them this sort of diversion. The purely natural benefits of travel are enormous, in terms of expanding an individual’s horizons, making him better able to understand folk unlike him, giving reality to the things he learned in school, and on and on — and this is true for the Catholic and the non-believer alike, on a natural level. But as with Time, Space too has an Enchantment for the former that the latter can only dimly share. This sort of tourism has deeper origins than the other — dating back to that self-same time when travel was done on foot or horseback. The first and most important site of pilgrimage were the Holy Land, Rome (with St. Peter’s, the Holy See, the Vatican, and all the Roman churches), and Santiago de Compostela in Spain. But miraculous relics, Marian and other apparitions, holy wells, and the doings of various Saints created a network of local shrines across Italy, France, Spain, Germany, the Low Countries, and wherever the Catholic Faith was practised — even into the Americas — (including these United States) and the East Indies, where the work of saintly missionaries added another genre of pilgrimage sites. The purely natural and artistic aspects of these places often attract non-believers in search of — something — and not only does the earlier mentioned World Heritage List feature scores of these sites, but the Council of Europe’s cultural routes programme has added to its itineraries trails linking shrines of St. James, St. Martin, St. Michael, St. Olav, and the Cluniac and Cistercian monks. For all that the so-called Reformers destroyed many of these places in Britain, Scandinavia, and Northern Germany, a number of these as well as pilgrimage routes have made a comeback in recent years, as locals slowly rediscover the magic that once upon a time enchanted their countryside. How much more precious must experiencing these places be for the Catholic? Gazing upon a place where the Blessed Sacrament has turned to visible flesh and blood, or where one of the thorns of Christ’s crown bleeds every Good Friday, or Our Lady prophesied to children, or whatever it might be, makes the Faith real to the Catholic in a way that the most learned book of apologetics simply cannot, and that the most uplifting devotional manual merely begins to approach. Ours is a flesh-and-blood religion centred upon an Incarnate God, but it is easy to forget that in a society that does its best to make us forget, and to banish Faith to some unseen realm. And while it is extremely invigorating to travel to any of the faraway shrines, it should also be remembered that most dioceses have such places — and as earlier mentioned, these too can have the effect of lifting us out of the illusory dullness and dreariness of modern life, and bringing us back to the enchantment of reality. There is a third way for the modern mind to encounter enchantment; although it can encompass both Space and Time, this third is that of Action. We shall look at it in our third and final installment, next month.